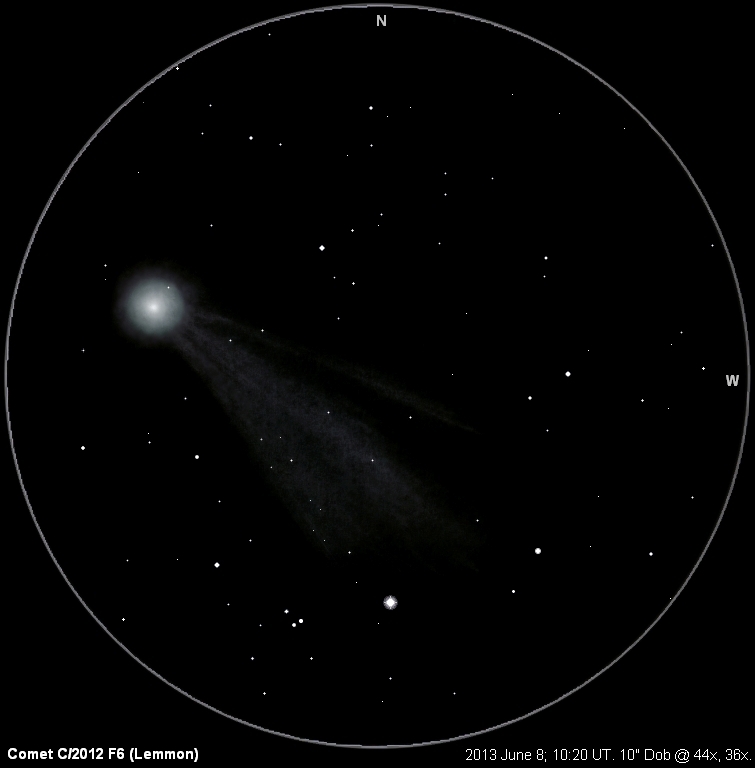 I got out for a short session on this Saturday evening to view and sketch a couple of comets. Skies were average with limiting magnitude 6.7-6.8. The temperature was dropping rapidly, and eyepiece fog was a problem. C/2017 T1 (Heinze) was near Cassiopeia. I picked it up immediately in my 10" Dob at 47x. It was a diffuse, somewhat elongated object. I tried an UltraBlock nebula filter, which sometimes firms up the view of diffuse comets; there was essentially no response. At 104x, the inner coma was more well-defined and parabolic, with an essentially stellar nucleus. The outer coma was very diffuse, and traced out to a diameter of about 4'. A tail about 10' long extended to the E, and arose from a spinelike jet that appeared to split. The comet's westward motion was obvious within a few minutes. 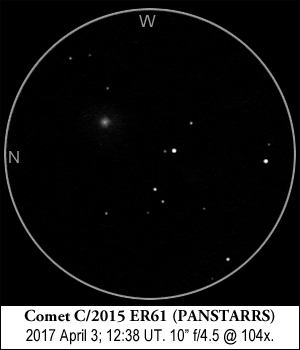 Comet C/2016 R2 (PANSTARRS) was in Taurus near the Hyades. It, too, was readily if faintly visible at 47x, but smaller and more condensed. At 165x, the inner coma was condensed, but no discrete nucleus was visible. The outer coma appeared faint and irregularly round, growing with averted vision to a diameter of about 2'. The coma was smeared into a short tail 2-3' long to the ESE. After the comets, I dropped down to Orion to look at M42 and surroundings. Seeing was pretty decent with 6 stars in the Trapezium readily visible, but I had problems with moisture in my eyes. I also looked at the Flame and Horsehead complex. I could make out the dark void of the Horsehead at 104x without a filter, but there was little context. At 47x with the H-Beta filter, the almost-invisible glow of IC434 became bright, allowing the Horsehead to become a silhouette, albeit small at this magnification. The view was very dim with the filter at 104x; I have an eyepiece that produces 76x, which gives a better scale of the Horsehead itself, but it is a narrower-field eyepiece that doesn't provide as much context. I am behind on observing logs. I still haven't posted my Oregon Star Party/Total Solar Eclipse report from August. After the star party, there was a long run of smoky skies from forest fires, followed by mostly cloudy weather conditions. I did a short, rather slow Leonid observing session on the morning of November 18th under skies with a lot of fog and haze around the edges. On the morning of the 19th, I hoped for better skies in order to catch 3 comets I had seen before. C/2017 O1 (ASASSN) was well-placed above Polaris. I had seen this one during OSP in August. I star-hopped from a pair of naked-eye magnitude 5.5 stars, and the comet was easy enough to see in my 10" Dob at 47x. It was faint with a small, inconspicuous central condensation (DC~3). Coma was round, about 8' in diameter and faded into the background. An UltraBlock narrowband filter firmed up the view a bit and increased contrast in the inner coma. Coma maybe slightly elongated to SW.
Transparency was decent high in the sky, with a limiting magnitude of 6.8. My next target, Comet 62P/Tsuchinshan, was in Leo near the M65/66/NGC 3628 group and just above the haziest part of the sky. 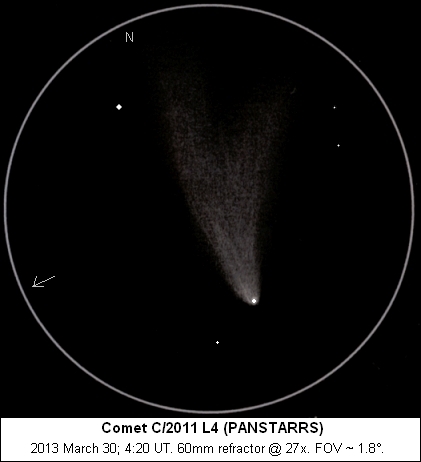 I had previously seen this comet in 2004. It was easy at 47x, looking fairly condensed and bright. Unfortunately, sky condiions deteriorated soon after I acquired it, and it never again matched my initial impression. At 104x, I rated it as DC~5 with a coma about 4' in diameter and elongated to the WNW. There was a hint of jet structure in PA~290°. The surrounding sky turned milky and lost contrast during the observation. 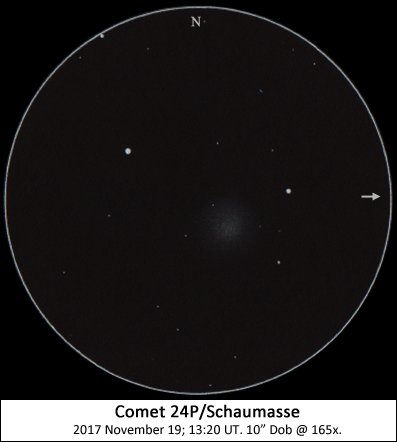 I didn't have much hope of seeing Comet 24P/Schaumasse given the hazy conditions. I had seen 24P during two previous apparitions, in 1993 and 2001. The field was nearly white at 47x from fog and smoke. Fortunately, transparency improved markedly over the space of a half hourand I was able to pick up a little smudge at 165x. Coma was round, slightly brighter in the middle (DC 2 or 3) with a diameter of about 2'. I noticed the comet's motion to the ESE during the observation. Even as conditions improved, twilight encroached, and I packed up in the frosty 15°F dawn. This Saturday night promised to be a good opportunity to get the scope out and observe without worrying about being too tired the next morning. Astronomical twilight ended at 10:50pm and the moon would rise at about 12:30. In between, I decided to hunt down two fairly bright supernovae in spiral galaxies. The night was decently transparent, and above average for summer. At midnight, I got a limiting magnitude of 6.9 near the zenith in Lyra. Seeing started out at about average and deteriorated a bit, resulting in blurry and wobbly views of Saturn. I also kept my magnification relatively low on the deep sky objects. My first target was SN2017erp in NGC 5861 in Libra. I starhopped south from Beta Librae, passing the galaxy NGC 5885. 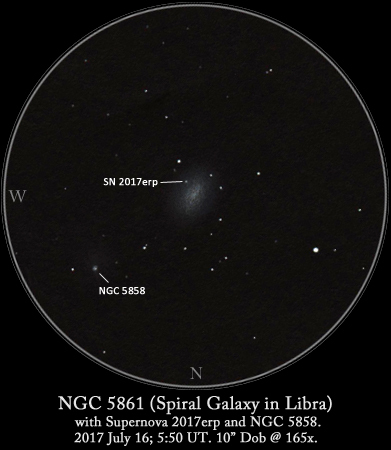 NGC 5861 was immediately visible as a faint oval smudge at 114x, and the supernova was visible as well. The supernova popped in and out of direct vision, but I held it better when I increased the magnification to 165x. The supernova was about the same brightness as a nearby field star of magnitude 13.9, in line with current measurements. An auroral display was possible, but didn't materialize at my site with a compromised northern horizon and imminent moonrise. I rounded out the early morning with casual observations of M8, M20, M17, M16, and the Veil and North America nebulae. I counted meteors for 3 hours on the morning of April 22nd. Skies were good with limiting magnitudes between 6.7 and 6.9. Meteor activity was about as expected: 34 Lyrids for an average of 11 per hour, 6 Antihelions and 15 sporadics. The highlight of the session was a Lyrid fireball of magnitude -6 that ended in a terminal burst in Ursa Major. This brilliant bluish meteor left a persistent train for about 30 seconds. The Lyrids were bright on average with a mean magnitude of 1.8 (mean magnitude for the sporadics was 3.0 and for the Antihelions was 1.8). The final hour was marginally the most active with 15 Lyrids. I've been in a non-observing rut for a long time. Before this month, the last time I had my 10" Dob out was in September. I've either been too tired from work, or focused on other activities, or the weather hasn't cooperated. I finally dusted off the Dob (literally) a few days ago, and the promise of some "new" comets to observe in the morning sky spurred me to wake up during predawn hours, on a Monday no less. 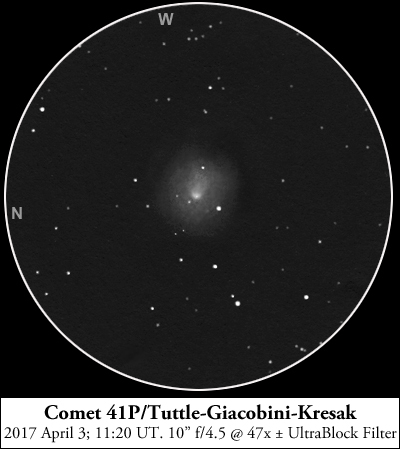 My first target was Comet 41P/Tuttle-Giacobini-Kresak, fresh off its close approach to Earth. It was easily visible in my 10x42 binoculars near Alpha Draconis as a fuzzy patch among bright field stars. In the 10" Dob at 47x, it showed as a large, diffuse patch with a slightly squashed oval inner coma and a nonstellar central condensation. The brightness dropped off rapidly away from the center. The comet's eastward motion against the starry background was visible within a few minutes. When I attached the UltraBlock narrowband filter, this significantly increased the prominence of the outer coma and made a broad tailward extension (7' long in PA 260) more obvious. Total coma diameter was roughly 15'. Sketch. Raising the power to 104x increased the detail visible in the inner coma and revealed a stellar pseudonucleus and better showed jets on each side of the central condensation that contributed to the oval appearance of the inner coma. 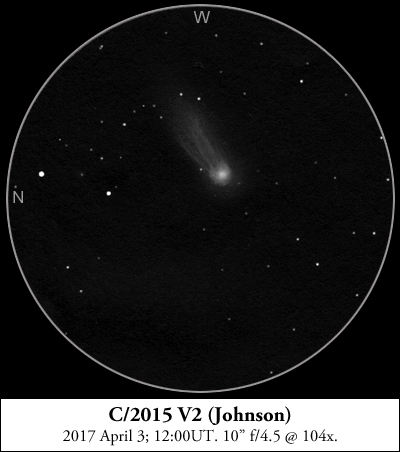 Next I turned to C/2015 V2 (Johnson), in Hercules. At an elevation of about 85 degrees, this comet was in Dobson's Hole, but also in a nice dark sky. It was visible as a faint fuzzy star in the binoculars, but looked like a classical comet when I turned the Dob on it. It had a round coma with a bright central condensation and stellar pseudonucleus, and an obvious tail about 10' in length in PA 300. Coma diameter was about 2.5'. A couple of faint streamers were visible in the tail. Sketch. Some clouds had passed through earlier in the night, and at first the eastern horizon didn't look promising. 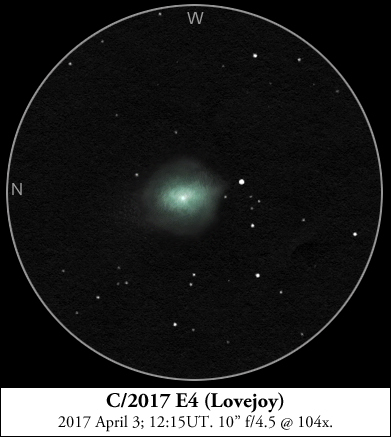 But by 5am when I turned my attention to Comet C/2017 E4 (Lovejoy), that area of the sky was clear. The comet was easily visible as a strongly condensed, compact object in binoculars. In the Dob at 104x, it was an oval object with high surface brightness and a prominent cyan hue. It had a bright central condensation and a bar-like structure along the major axis of the oval. I was unable to see the long tail visible in photos. Coma dimensions were about 4' x 2', with the coma elongated roughly N-S. Sketch. I was fighting twilight and trees to find my final comet of the morning, C/2015 ER61 (PANSTARRS). I needed to relocate the scope to clear trees, and then I still didn't get it in the right spot. The sky was brightening, and my field was partly obstructed by a carport, but the comet rose high enough that I was able to catch it at 104x as a faint, round fuzz, brighter in the center. Sketch. I got a quick, rough view of 45P/Honda-Mrkos-Pajdusakova this evening from my yard. The comet was surprisingly easy in 10x42 binoculars despite deteriorating conditions. I also pulled out my old 60mm refractor and viewed it at 27x. 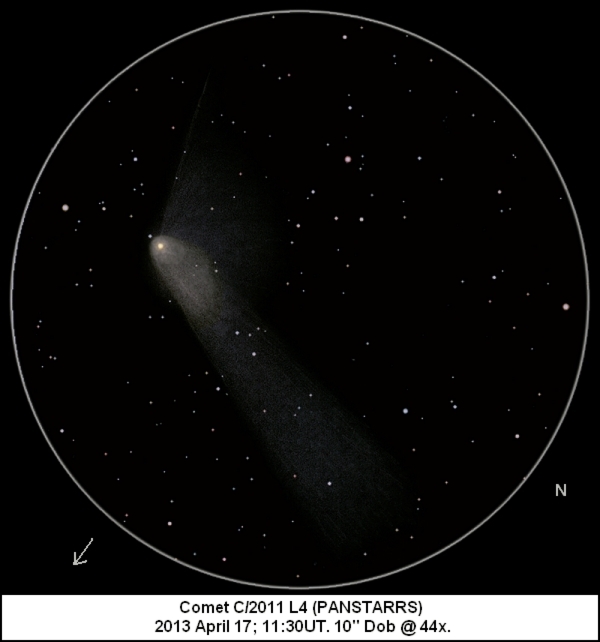 The comet was moderately to strongly condensed (DC ~6), with a coma about 3' in diameter and magnitude ~7.5. I wasn't sure about a tail in binoculars; I didn't see a tail in the refractor. I got in a couple of short casual Geminid watches during cloud breaks. On the morning of December 12th, I watched for 13 minutes from 5:21-5:34am PDT and saw 4 Geminids, 1 Sigma Hydrid and 1 sporadic. On the morning of the 13th, I watched for 52 minutes from 5:00-5:52am PDT and saw 21 Geminids and 1 sporadic. I saw a couple of fireball-class Geminids on the 13th, both bright white with a violet tinge. I got out at around 9pm PST (5:00 UT). My scope had been cooling for 90 minutes, but hadn’t reached equilibrium. Also, there was rapid small-scale scintillation. 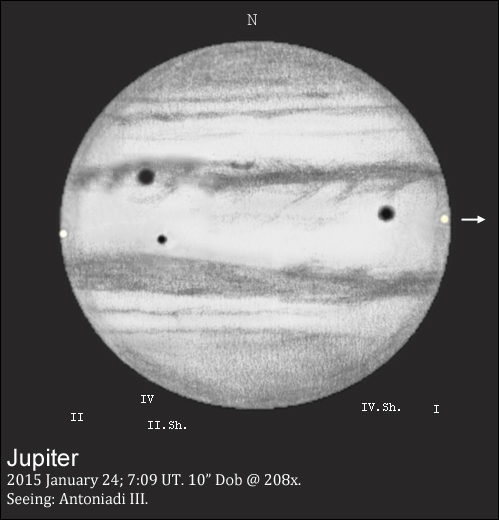 The shadows of Callisto and Io were readily visible on the roiling disc of Jupiter. Io itself was invisible. Viewing was most comfortable at 104x, and there was little if any fine detail visible on Jupiter. 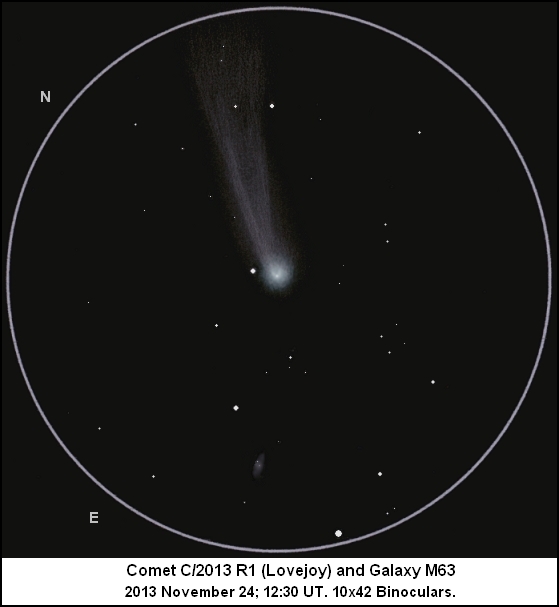 I took a look at Comet Lovejoy (faded a bit, still naked eye, several degrees of bright tail). Transparency was mediocre and humidity was high. Air temperature was on its way to the upper 20’s (F). At around 9:30pm, I came back to Jupiter and started a rough sketch. Seeing was still rough, but I used 165x and occasionally 208x to try to see as much detail as possible. I hoped to catch Io when it was partially eclipsed by Callisto’s shadow. I noticed a prominent (considering the conditions) projection/festoon from the southern edge of the North Equatorial Belt following the moon shadows. I included it in my sketch. With the poor seeing conditions, the shadows of Io and Callisto appeared merged for a number of minutes. 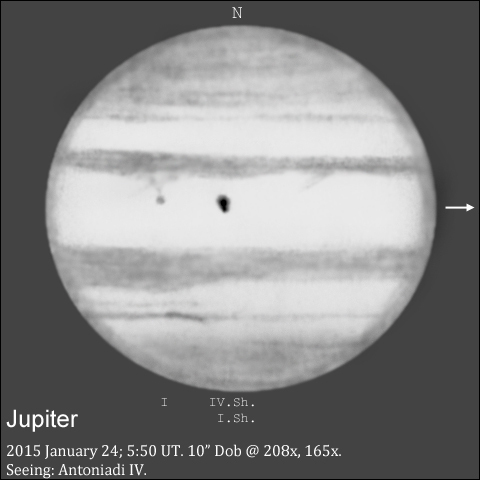 At 9:48pm, I positively noted the appearance of Io as a dusky gray spot at the tip of the festoon. Io transformed the look of the festoon from a projection with a trailing component (presumably connected to an invisible Equatorial Band) to a pointed projection with a ball at its tip. Io darkened and became more prominent through 9:50pm before fading and becoming essentially invisible again a bit before 9:52pm. 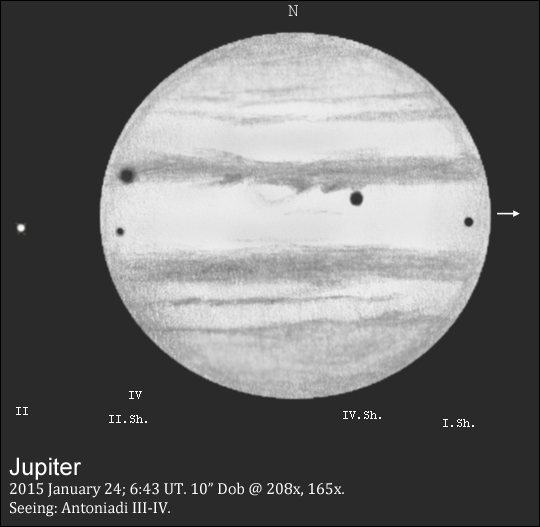 At the same time, Io’s shadow visibly started to pull ahead of Callisto’s shadow, although the two remained merged until 9:58pm. The next big event during the transit was the occultation of Callisto’s shadow by Io. A broken cloud band moved through at around 10pm, and the remnants were still present during the beginning of the occultation. The changing obscuration made it difficult to judge the prominence of Callisto’s shadow from moment to moment. Callisto’s shadow had always been significantly more prominent than Io’s. By 10:17, I thought I could see a bit of attenuation in Callisto’s shadow. At 10:20:45pm, Callisto’s shadow appeared grayish and slightly less prominent than Io’s, but I didn’t see any internal detail. By 10:23:30pm, Callisto’s shadow was equal to Io’s, and by 10:24:20pm was clearly superior again. Overall, this was a very subtle event. At 10:26, I could see the disc of Callisto as a dark spot in the southern section of the North Equatorial Belt on the following edge of Jupiter. At 10:28:40, Europa’s shadow started to impinge on the disc, completing the triple shadow assemblage. I sketched the view as seen at 10:43pm. At 10:53pm, I noted that Io’s shadow had left the disc. At 11:01, I could see Io proper as an intense white spot in the limb darkening on the preceding edge. Meanwhile, Europa proper was approaching the following limb. For a brief moment, bright satellites were touching each limb while three dark spots were on the disc. I made this the focus of my final sketch centered at 11:09pm. Afterwards, seeing finally improved to a solid average, and I spent some time digging out as much planetary detail as I could. 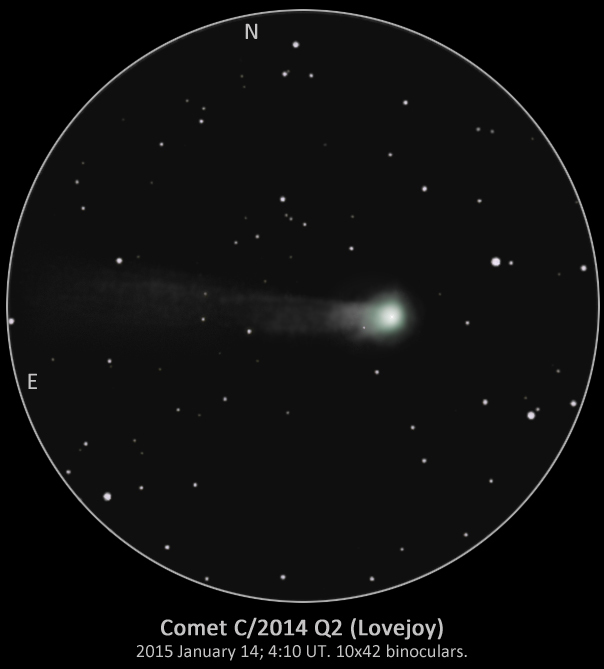 I viewed and sketched comet C/2014 Q2 (Lovejoy) through my 10x42 binoculars. The comet remained an easy naked-eye object, a "fuzzy star" of magnitude 3.8. I couldn't see a tail with the naked eye. In binoculars, the comet showed a 25' coma and a rather faint but obvious tail that stretched for at least 4 degrees in PA 75. The first 0.5 degree of tail was bright and prominent; the next 2 degrees were easy to see and showed some fine structure. After that, the tail was faint and diffuse, fading into the sky background. The pseudonucleus was a bright stellar nugget at the center of a pale cyan inner coma. There were a couple of projections from the inner coma. One was at PA 100 and about 20' long, blending into the south edge of the tail. The other, broader and fainter, was in PA 345 and manifested as a brighter patch in the outer coma. Fine linear structure was faintly visible in the tail, particularly in the brighter part near the coma and along the northern edge. I tried to capture this in my sketch. I went out for a little over an hour tonight (Wednesday evening) to catch C/2014 Q2 (Lovejoy) between evening twilight and moonrise. Skies were variable due to local wood stove smoke, but at the clearest I could see down to magnitude 6.7 in Taurus. I had gotten a quick look at Lovejoy through 10x42 binoculars and with the naked eye Tuesday evening. I had noted its magnitude as about 4.1 naked eye (4.3 through binoculars). Coma diameter was large, maybe 25’ in binoculars, and a very faint, short tail was visible in binoculars. I didn’t do a detailed estimate tonight, but the comet looked a smidgen brighter. 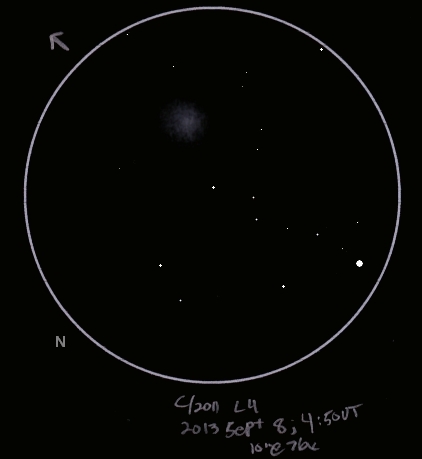 Tonight, I concentrated on viewing the comet through my 10” Dob and making a sketch. The comet had a huge round coma with a diameter of maybe 20-25’ (difficult to determine where the coma faded into the sky background). The coma had a definite cyan tint. 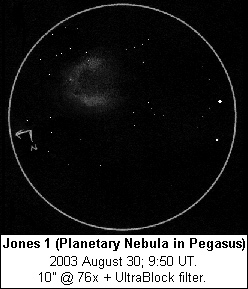 There was a bright stellar pseudonucleus at the center of the coma—this appeared to be about 9th-10th magnitude at 47x. The inner 5’ or so of the coma was bright and condensed, surrounded by a zone of moderate brightness out to a diameter of 10’ and then by a diffuse outer shell. A tail was faint but obvious in PA ~65. I tried to determine the tail length in binoculars and at several low powers in my Dob, and invariably lost it at about 1° from the center of the coma. Tail width was 5-10’. Some very faint, fleeting structure was visible in the tail at 36x and 47x in the Dob. At low powers in the Dob, I also saw a broad, brighter extension of the coma from PA ~120-170. Maximum length of this was about 15-20’, so it was mostly superimposed on the coma. I suspect this is a dust fan, and it seemed to have a warmer color tint than the rest of the coma. A few of the photos that I’ve seen show hints of this feature; others do not, maybe because the coma is overexposed. I don’t think it is illusory, though. I took a quick look at the area around the pseudonucleus at 104x just as the sky was deteriorating with the impending moonrise, and saw some subtle structure there as well. Monday evening, I braved the cold for a short evening session with my 10" Dob. Skies were mediocre with some local wood stove smoke and high clouds. Naked eye limiting magnitude was 6.3. My main target was Comet C/2014 Q3 (Borisov). The comet was in Ursa Minor, not far from the star Eta UMi. I starhopped to the comet and found it extremely faint and diffuse, a hazy spot that kept nagging at my vision. The comet appeared to be about 6 arcminutes in diameter, fading into the sky background and essentially round. There was a very slight central condensation. I estimated the comet's magnitude as 10.5 and the degree of condensation as 2. The comet showed a moderate to strong response to my Orion UltraBlock filter (a narrowband nebula filter). With the filter, it was more obvious and better-defined. The comet's motion to the SSE was obvious after 30 minutes or so. Sharing the low-power field was the little galaxy NGC 6412, just over the border in Draco. The galaxy was much smaller than the comet (diameter <2 arcminutes) and much more condensed. The galaxy was readily visible with direct vision, and more obvious than the comet. Using comparison stars, I estimated the galaxy's magnitude as 11.9. I really liked this combination of two objects where the smaller and "fainter" one was easier to see, so I had to sketch it. I printed out the Cartes du Ciel starfield and sketched the comet and galaxy on it. 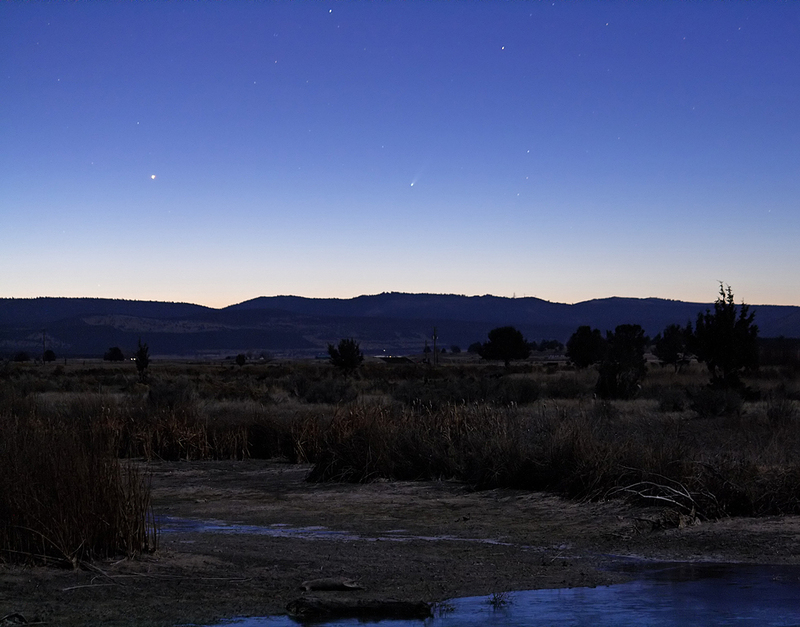 I did 1.5 hours of meteor observing, ending in morning twilight. Skies were slightly better than the previous morning. The first half-hour was amazingly productive with 22 meteors! Of course, it was immediately followed by a 15-minute drought. I saw a total of 50 meteors: 11 South Delta Aquarids, 9 Perseids, 5 Anthelions, 2 Alpha Capricornids and 23 sporadics. I got out for a split evening/morning session. There wasn’t much smoke on the horizon, but the sky didn’t seem to be as dark or have as much contrast as normal. Limiting magnitude high in the sky ranged from 6.4-6.6. Seeing was average. 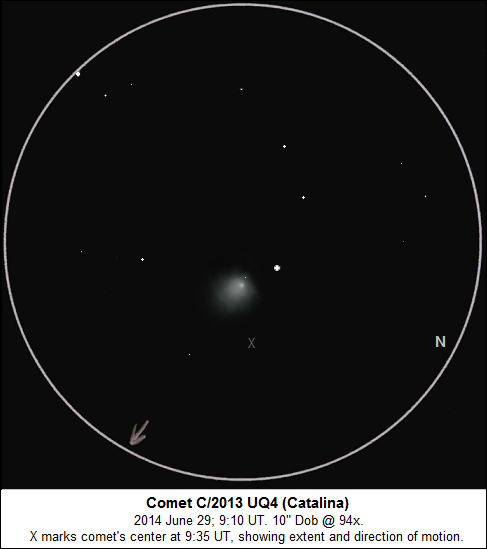 My first target was comet C/2013 UQ4 (Catalina). It was visible in my 10” Dob as a ghostly blur with little condensation. I got fleeting glimpses of a possible stellar nucleus. The comet seemed to fade in and out with direct vision. The comet responded modestly to the Orion UltraBlock filter - at 104x, the inner coma seemed more defined with the filter in place. Averted vision revealed a diffuse outer coma 7 arcminutes in diameter. The overall shape of the coma was round, but the slightly brighter inner portion seemed to expand to the SW. I estimated the comet’s magnitude at 12.0 in the 10” at 47x. Sketch. I visited Seyfert’s Sextet (Hickson 79 or the NGC 6027 group) again. The group itself is easy as a fuzzy object at any power in the 10”. Using powers between 165x and 330x, I could make out 3 separate members with difficulty. Different sources give different designations to the members. The easiest one is often labeled as NGC 6027E. Just across from it is NGC 6027A. At times, NGC 6027 joined them in a triangle. The other members avoided detection. Even if seeing all the member galaxies is a long shot in a 10”, I’d like to try them on a night of pristine transparency at OSP and also look at them in a big scope. A little more poking around and an extended tour of the Veil Nebula, and then I went in for a nap. At 2am, I did an hour’s meteor observing. I saw 18 meteors: 7 South Delta Aquarids, 7 sporadics, 3 Perseids and an Anthelion. Better transparency would likely have increased my total significantly. There were nice bright meteors from both active showers, but no fireballs. I set the scope back up and took an extended look at M33. The big galaxy showed awesome structure, best at 165x even as it spilled out of the field. I verified that I could see the four superimposed NGC knots (604, 595, 592, and 588) and also picked out some of the IC objects. 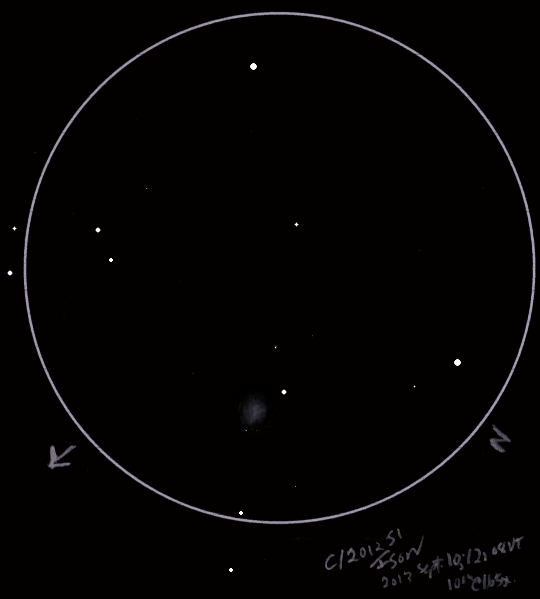 Obviously, if the weather cooperates at the Oregon Star Party, I will do a detailed sketch. My real target of the morning was comet C/2014 E2 (Jacques). The comet, just 9 arcminutes NE of 5th-magnitude star 14 Aurigae, was obvious in 10x42 binoculars and looked like a very condensed globular cluster (similar to NGC 1851 in Columba). The 4.5-arcminute coma was bright and evenly-illuminated in the binoculars. In the 10”, the coma at first appeared round with a bright nonstellar central condensation surrounded by a brilliant inner coma and gradually-fading outer coma. The coma diameter as seen through the scope at 165x was 3 arcminutes. As the comet gained altitude and I gave it extended attention, the coma looked more fan-shaped with a wispy tail to the W (ion tail?) and a short, broad elongation to the S (dust tail?). At 47x, I could trace the ion tail for about 10 arcminutes. A couple of jets were visible in the inner coma. The comet’s motion to the NW was obvious over 20 minutes as it passed by an 11th-magnitude star. Sketch. On Saturday night/Sunday morning, I went out for a “long session”. I spent about 4 hours observing. 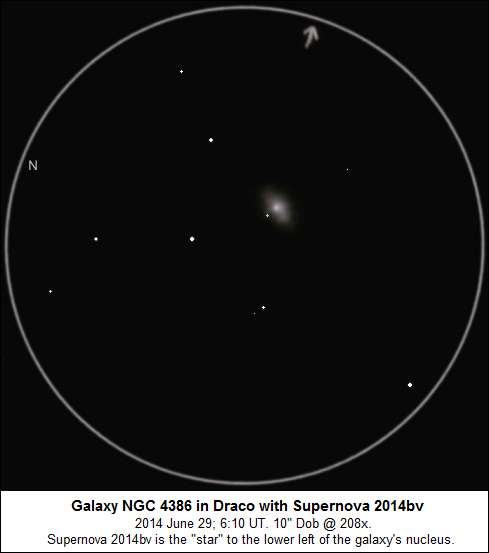 My first target was the recently-discovered supernova (SN 2014bv) in NGC 4386 in Draco. There are quite a few middling galaxies in the area. NGC 4386 has a bright center and fuzzy rounded inner region. The oval disc is broadly elongated NW-SE. The SE half of the disc is brighter and more defined. The galaxy fades sharply along its NE edge, leaving a dark gap between the edge and SN 2014bv. The supernova competes with the galaxy’s nuclear region as far as brightness. Sketch. While in the area, I looked at other galaxies including the very nearby NGC 4291 and 4319. I gave a shot at the quasar Markarian 205 near NGC 4319, but I couldn’t pull it out though I’ve seen it before. Seeing was decidedly below average, and transparency was decent but not pristine (limiting magnitude about 6.6 at the zenith). There was a lot of moisture in the air. Other galaxies I stopped at were NGCs 4133, 4589, 4648, and 4750. All of these are easy 11th-12th magnitude objects with little detail visible. Summer observing means I’m thinking about the Oregon Star Party coming up in August. The advanced observing list this year is a “pick 10” from a variety of objects, some of which are well beyond my reach with a 10” scope. Others are borderline, and a few are straightforward. The NGC objects embedded in M101 are on the list. I didn’t really tackle them tonight, but I took a quick look at the big galaxy and saw a few of the prominent star clouds. I also poked around the galaxies within a few fields of M101 while I was in the area. Also on the advanced list is the planetary nebula M 2-9, or Minkowski’s Butterfly. I wasn’t sure what to expect when I hopped to this one, but it was actually visible as a faint elongated haze with a bright center. Despite the mediocre seeing, I pumped the power up to 330x and could see a strongly elongate shape with a stellar center. The OIII filter did nothing to enhance the nebula. I made a quick sketch. This one is easy and interesting enough that I will probably dedicate some real observing time to it at OSP. Another object on the OSP advanced list is Seyfert’s Sextet, with the stipulation that at least 5 of the 6 component galaxies need to be identified. I remember looking at this once or twice before in my 10”. It’s a bit of a confused mess, relatively easy to see as an irregular lumpy blob but hard to get a handle on what’s what. I would definitely want a much better sky to try to make sense of this one. After seeing a post on Cloudy Nights, I printed out the finder chart for the blazar 3C 454.3. Normally around 17th magnitude, this quasar has recently been in outburst to magnitude 14 or brighter. The blazar sits just 15” from a 13th-magnitude star. It was easy enough to find, and sure enough I saw the faint double star. The blazar seemed a bit fainter with softer light than its line-of-sight companion. Of course, at these low light levels, no color was visible. After some showpiece observing and a little break, I tackled my only cometary target of the session. C/2013 UQ4 (Catalina) was in Andromeda near the borders of Pisces and Pegasus. This comet is brightening and moving to the NW at a good clip. It was easily visible at all powers in my 10” Dob. Catalina featured a relatively large, round coma about 3’ across and gradually fading out at the edges. There was a stellar pseudonucleus and bright inner coma offset to the east. The inner coma was elongated toward the west. I estimated the comet’s magnitude as 11.0. An Orion UltraBlock filter improved the contrast and visibility of the outer parts of the coma at low powers. The comet’s motion was noticeable minute-to-minute, especially as the coma separated from a 14th-magnitude star. Sketch. My schedule has been such (isn't it like this every spring?) that I let three months go by without getting the Dob out. Now evening twilight lasts until after 11pm, so staying up to observe is a bear. Even though I wasn't at my best, I threw in what I used to call a "short session" (1.5 hours) on Saturday night. My first target was the comet C/2012 K1 (PANSTARRS). 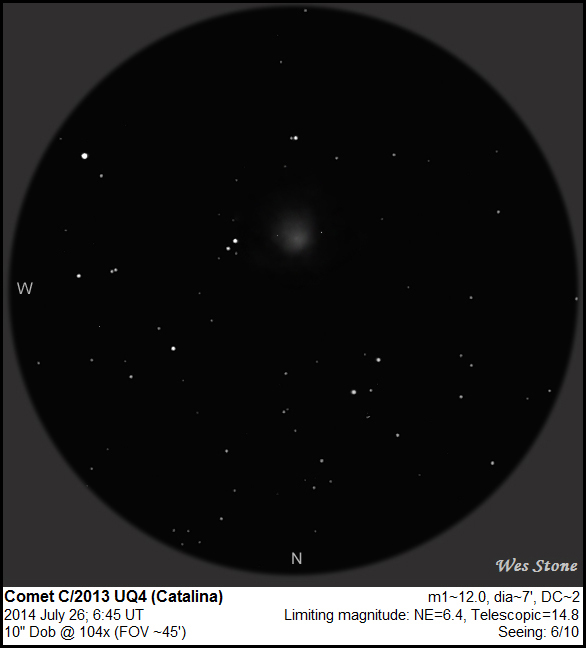 On New Year's Day, the last time I saw this comet, it was a very faint morning object. Tonight, it was a bright evening comet, visible in my 10x42 binoculars, but also swiftly approaching the trees to my west as the sky was getting dark. I managed a hurried sketch. The coma was bright, strongly condensed, and slightly bluish. The comet was sandwiched between two bright field stars of 9th and 10th magnitude. Its inner coma was parabolic with a small, essentially stellar central condensation. The diffuse, rapidly-fading outer coma was about 2.5' in diameter. There was a hint of a very faint eastward-pointing tail about 12 arcminutes in length. After that, I mainly poked around showpieces, as I normally do when I'm shaking the rust off. Skies were excellent overhead but a bit murky near the horizon. Seeing was unimpressive. Some of the non-M objects I swept up included the little planetary NGC 6891 in Delphinus (small with a bright central star and two blue shells) and three galaxies in Draco (NGC 6503, NGC 6340 and NGC 6643). I woke up to clear skies on the morning of May 6th. As I was setting up at 3:15am PDT (10:15 UT), I saw a magnitude +2 Eta Aquarid earthgrazer, which I took to be a good sign. I observed from 10:22-11:45 UT, and saw a smattering of Eta Aquarids against a fairly rich sporadic background. Unfortunately, the shower was not nearly as active as it was in 2013 (but I had better success than most of my past Eta Aquarid attempts). I live at latitude 42.6 N, so this shower is always a pretty marginal event. In 1.2 hours Teff, I saw 11 Eta Aquarids (mean magnitude +1.5) and 10 sporadics (mean magnitude +2.5). Skies were decent, with a limiting magnitude of 6.8 at the beginning of the watch. Twilight gradually took its toll. Limiting magnitude was still 5.7 at the end of the watch, but I saw no meteors during the last 15 minutes. The Eta Aquarids were fast, typically with wakes and short trains. The best of the morning was a long-pathed –3. I didn’t see much color in the Eta Aquarids. 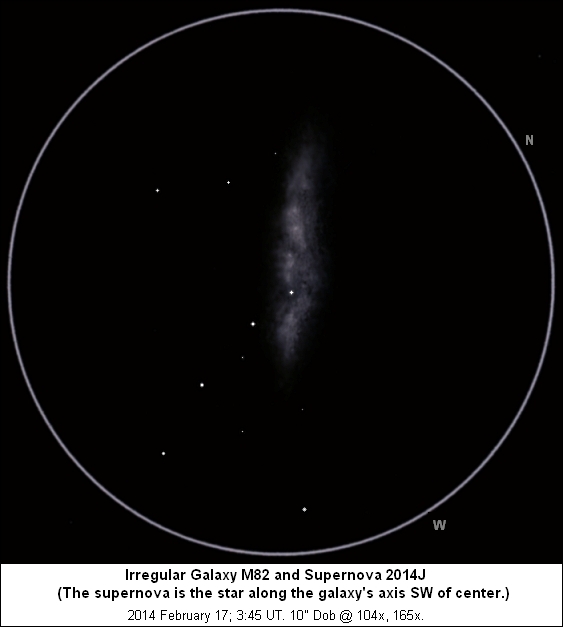 With a small window between twilight and moonrise, I went out to see and sketch Supernova 2014J in M82. Skies were OK; a bit moist with a few high clouds. Still, the galaxy was very impressive as usual, and didn't suffer much even when the moon was lighting up the eastern sky. The supernova was at about magnitude 11.5. I didn't see any color in it. My sketch was a bit hurried, but should communicate my impression. I also took a quick look at Jupiter. Seeing was below average, but Europa's shadow was on the disc and I could occasionally just make out the Great Red Spot as it neared the edge. I did a morning session to sketch the three comets that I viewed on December 29th. 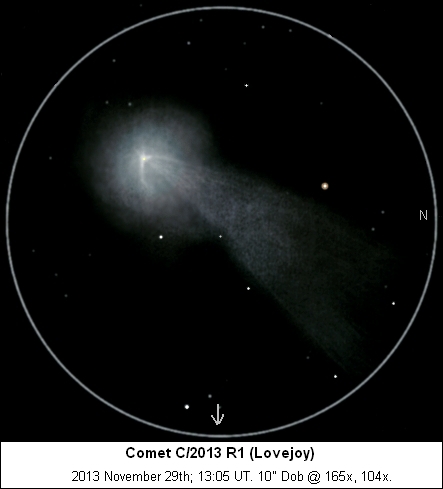 I started with C/2013 R1 (Lovejoy). The comet was a faint naked-eye object of about magnitude 5.8. In binoculars and at low power in my 10" Dob, one degree of bright tail was visible, plus another degree or so of very faint tail in PA 335 degrees. The coma was about 5' in diameter and dominated by a bright stellar nucleus with two broad "wings" projecting from its sides and sweeping tailward. The western side of the tail was brighter with more structure; the eastern was more diffuse. Sketch. 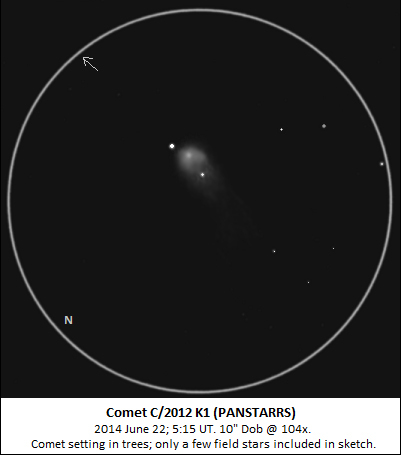 C/2012 K1 (PANSTARRS) was on the threshold of direct vision and popped out with averted vision. A condensed coma 1' in diameter with a bright nonstellar core was bracketed by several 14th-magnitude stars. The coma appeared to be slightly elongated E-W. Sketch. C/2012 X1 (LINEAR) was a bright 9th-magnitude object. It formed an isosceles triangle with 9th- and 11th-magnitude field stars, although the symmetry was soon disrupted by the comet's noticeable motion to the southeast. The coma was round and about 3' in diameter with a stellar nucleus offset to the southeast. A bright core was surrounded by a faint envelope. There was subtle asymmetry in the coma, with the core being brighter on the north side and a couple of projections to the south and east. A short tail, brighter in the center, projected about 3.5' in PA 310. Sketch. I planned a split session where I would observe some deep-sky objects and Jupiter during the late evening and then get up before dawn to see comets. The evening session was pretty much just poking around. Transparency was good and the air fairly dry. I hit stuff like M42-43, M78, and the Flame and Horsehead. After the Horsehead, I swept up some other H-beta filter objects such as IC 2177, IC 405 and Sh2-235, but I didn't do any sketches or note-taking. I swept through a bunch of galaxies in western Ursa Major as well, and visited NGC 2403. It was cold enough to be a bit uncomfortable. Seeing was initially pretty bad, but by midnight it calmed down enough for me to see Europa's shadow ingress onto the globe of Jupiter and catch the beginning of the transit by Europa itself. There were a couple of bluish, looping "garlands" on the southern edge of Jupiter's Northern Equatorial Belt, although overall detail was a bit muted. 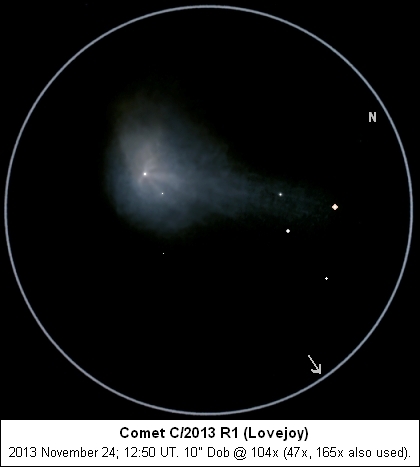 In the morning, I wanted to observe three comets--C/2013 R1 (Lovejoy), C/2012 X1 (LINEAR), and maybe C/2012 K1 (PANSTARRS). I got up at 4am, knowing the moon would be up by 4:30 and might be an issue even though it was a thin crescent. 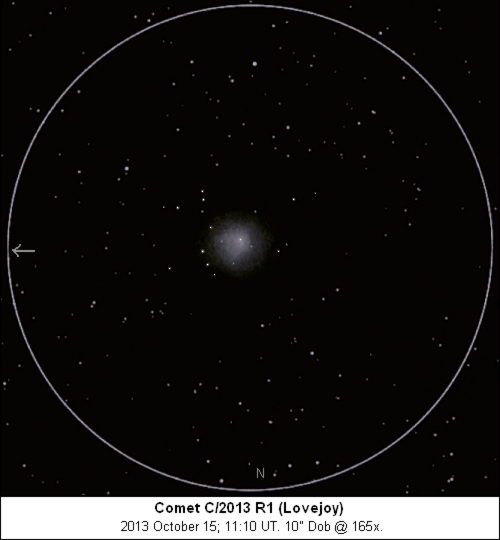 Comet Lovejoy was about magnitude 5.7 and near the edge of naked-eye visibility at its low elevation. A couple of degrees of tail were visible in 10x42 binoculars and in my Dob at 47x. I passed by C/2012 X1 on my way to the fainter C/2012 K1, intending to come back later. C/2012 K1 was allegedly magnitude 13 or fainter, so I didn't know whether I would see it. It was only a little over a degree away from the bright C/2012 X1, so I thought I would try. At 104x and 165x, I was able to pull a small, fuzzy spot out of the sky background, next to a 14.7-magnitude star. As I was making a confirmatory sketch, the sky conditions deteriorated. Unpredicted high clouds moved in and stayed for the rest of they day. Weather recently has been mostly clear (except around the peak of the Geminid meteor shower, which was clouded out) but frigid. Early December saw 16" of snow fall in about 24 hours, followed by temperatures dipping to 20 below zero. As a result, I haven't been out with the scope. I finally made it out on Christmas evening. Winter evenings here aren't great for transparency (wood stove smoke) or seeing (rapidly-falling temperatures), but this one was better than most. Limiting magnitude reached 6.8, but was variable. Jupiter often wore a hazy halo. Seeing was a bit nervous, Antoniadi IV or sometimes III. I started out with the Crab Nebula, and enjoyed the subtle shape and detail in this old favorite. I thought it looked best at 208x with no filter. I poked around a few other bright winter sights and decided that the air wasn't transparent or dry enough for faint diffuse nebulae. I went after faint, condensed comets instead. C/2011 J2 (LINEAR) was near Polaris. This comet was reportedly around 13th magnitude. I thought I saw a milky spot at the comet's position at 47x. 104x revealed a faint, very condensed coma right next to a 14th-magnitude field star. I decided to wait to sketch the comet until an hour or so later, when its motion would separate it from the star. 290P/Jager was in eastern Auriga not far from the homely little open cluster NGC 2281. I glimpsed the comet at 47x, but it was better-seen at higher powers. I rated its visibility at 165 as AV1 or AV2 on the averted vision scale (possibly glimpsed occasionally with direct vision). The coma was small and round (about 1' in diameter), and condensed in the middle. I thought there might be a stellar nucleus displaced a bit to the north of center. I estimated the comet's magnitude as 12.9. Sketch. Returning to C/2011 J2, I initially had a hard time seeing it. When I did see it (at the AV3 averted vision level), it popped out as a very small and condensed, round, nonstellar core with a silvery hue and possible elongation to the NE. The coma diameter was only about 30' or so. I didn't do a formal magnitude estimate, but something around 13.5 would be about right. Sketch. After watching ISON's not-quite-demise play out on the web, I decided to go out and look at the comets I could actually see. 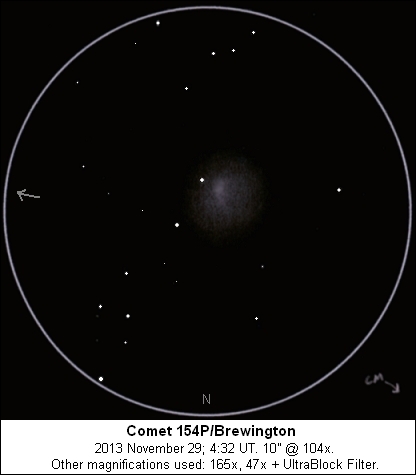 I started in the evening with Comet 154P/Brewington, well-placed in Pegasus. The Clear Sky Clock had predicted average transparency, but conditions were actually very good. The Zodiacal Band was faintly visible from Taurus to Pisces. I hopped to Brewington at 47x in my 10" Dob, and was a bit annoyed at finding the coma overlaying a 12th-magnitude field star. I poked around some DSOs for an hour or so (M33 looked really nice at 104x) while I waited for the center of the comet to move eastward from the star a bit. Brewington was a bit easier to see than in October, but is still a faint, mostly diffuse object. At low power, the outer coma responded well to my Orion UltraBlock filter. The coma was about 5' in diameter and round, although harder to see on the western edge where the field star interfered. At 104x, the comet showed a small central condensation about 1.5' x 1' and elongated N-S. At the edge of averted vision, the condensation appeared parabolic, opening to the east. The condensation was slightly brighter in the middle, but I didn't see anything stellar in there. Sketch. I retired for the evening, put the Dob in my car, and got up at 3am to go after more comets. I hadn't seen C/2013 V3 (Nevski) yet, so after a quick naked-eye and binocular look at C/2013 R1 (Lovejoy) I sought out this newer comet in Leo. I swept into the field and said to myself: "Wow, that's a diffuse mess." Nevski, also near a field star looked a lot like Brewington--a little smaller, a little brighter overall, but even less condensed. The UltraBlock filter didn't help with Nevski, and I could see as much of the coma at high powers as at low ones. Nevski was about 4' in diameter and essentially round. With effort at 104x and especially at 165x I could see a vague, slightly brighter condensation displaced a bit to the NW of center. There were several threshold stars in the coma that confused matters. In fact, the whole star field was surprisingly rich for this area of the sky. Sketch. A meteor (maybe 5th or 6th magnitude) streaked from east to west across my 104x field at 3:52am and left a faint, glowing wake that lasted a second or so. After I finished my Nevski sketch, I estimated the limiting magnitude using a couple of International Meteor Organization star count areas, and got 7.1 and 7.3. That's better than I've ever gotten from my yard. Unfortunately, things went downhill pretty quickly as even the 16%-illuminated moon made a dent when it cleared the trees. I think some thin clouds moved in as well. I looked at Jupiter. Seeing was just fair, but a lot better than it has been recently. Ganymede's shadow was obvious against the disc. Comet Lovejoy was an easy naked-eye fuzzy star with a hint of tail visible. I estimated its magnitude at 4.4. The comet formed a naked-eye double with a star of magnitude 6.4. In 10x42 binoculars, it looked much the same as 5 days ago, with a bright coma and a tail that was obvious for about 3 degrees and could be traced with difficulty for another degree or so. The tail looked like a bit fainter and less detailed than on the 24th. In my 10" Dob at 47x ... wow! A stellar pseudonucleus in a slightly bluish inner coma surrounded by a gray outer coma, with a tail looking like a gray contrail against the black sky and spreading out gradually as I traced it over three fields of view. At higher powers, the inner coma continued to be full of subtle detail. The central condensation appeared wedge-shaped with a bright center and several jets projecting. The bluish color of the coma seemed more subdued this morning. Sketch. I took a quick look at C/2012 X1 (LINEAR), but the crescent moon was reasonably close and twilight was encroaching. The view hadn't really improved over 5 days ago. With ISON now lost to the dawn, I got up early on November 24th to sketch Comet Lovejoy through binoculars and then set up the Dob to look at Lovejoy and C/2012 X1 (LINEAR). Despite moonlight, Lovejoy remained an easy naked-eye object. A tail was obvious in binoculars for about 3 degrees, then faded but could be traced with difficulty for another degree or so. This morning, the tail appeared to be two-branched. 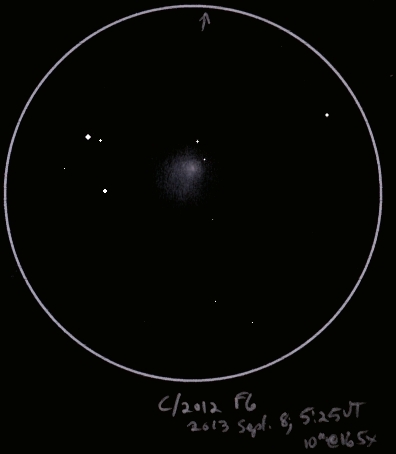 The galaxy M63 was visible in the same binocular field. Binocular Sketch. The coma was slightly bluish with a stellar nucleus, and appeared diffuse on the southern side with the suggestion of a short dust fan. All of these characteristics were more obvious in the telescope. Telescopic Sketch. The comet's motion was pretty fast--the star in the coma west of the nucleus was northeast of the nucleus 10 minutes earlier. The jets in the coma are a bit exaggerated on the sketch, and I concentrated on the inner coma so the tail is just roughed in. There appeared to be a short, broad dust fan to the east-northeast of the nucleus (toward the top of the sketch) that made an obtuse angle to the main tail extending to the northwest. Comet C/2012 X1 (LINEAR) was lower in the sky, and the 62%-illuminated moon took a bit of a toll on it. It was still easy to find as a fuzzy spot at low power in the 10" Dob. Higher powers revealed a small, bright nucleus and a parabolic inner coma that was brighter on the south side and opened toward the north. A fainter round shell about 3.5' in diameter was at the edge of visibility. Sketch. With news of ISON brightening, I went out on the morning of November 21st. I drove to a park with a decent eastern horizon and got there at around 5:20am. I was away from home with only my 10x42 binoculars on hand. 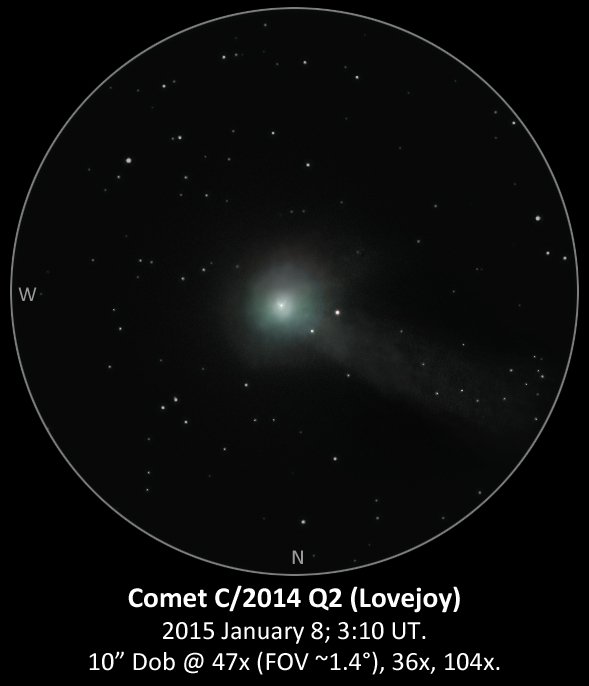 Comet Lovejoy was an easy target in the binox, and in fact an easy naked-eye object even in moonlight. Limiting magnitude was 5.7, and I'd estimate Lovejoy's magnitude as around 4.9. The coma was large and fuzzy (10-15' in diameter? ), condensed in the center but with no stellar nucleus visible at 10x. 1 degree of rather bright tail was visible, and beyond that another degree faintly visible. ISON was in low clouds near the horizon to the upper right of Mercury. When I first saw it in the binox, it was quite starlike with a hint of tail. It was strongly reddened at low altitude, but as it rose the still-stellar coma took on an icy-cold green tint. A rather thin, faint tail stretched out for a couple of degrees, and seemed brighter on the SE side. I never was positive that I could see ISON with my naked eye. ISON Sketch. I visited the same park on November 22nd and 23rd, with an eye toward taking some quick shots of ISON. I had decent success on November 22nd. ISON Photo. Ison was to the right of Mercury, with the frozen Lost River in the foreground. 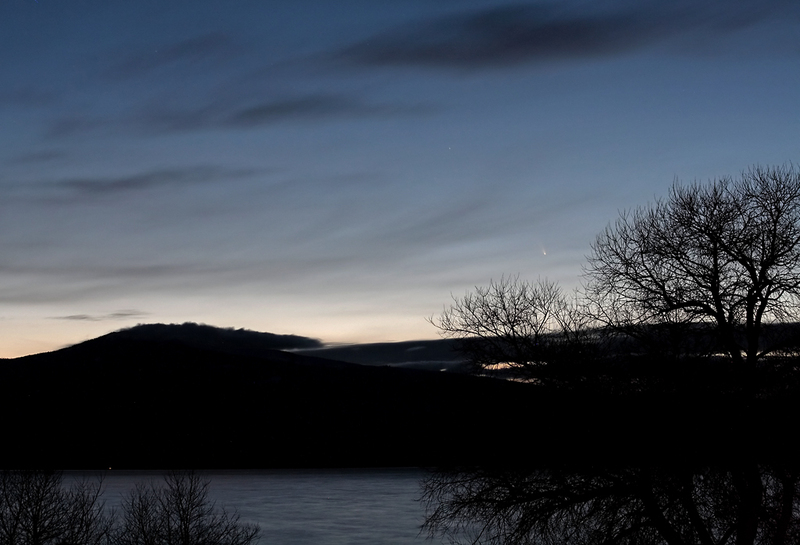 In the photo, Saturn is buried in the twilight glow to the lower left of Mercury. On the 23rd, ISON was at about the same altitude as Saturn, but to the lower right of Mercury. The comet, at roughly magnitude 4, didn't brighten appreciably, and I didn't see it with binoculars on the 23rd despite good conditions. 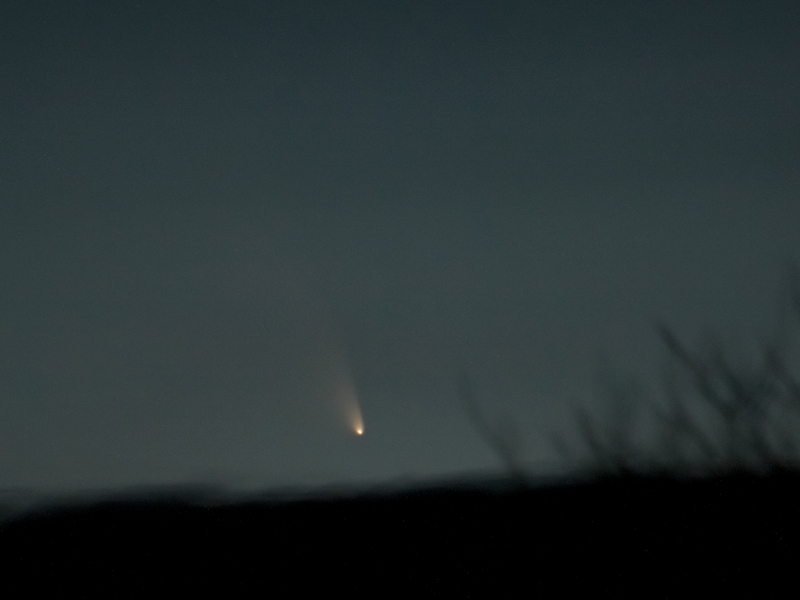 It did turn up as a very faint elongated fuzz in photos I took on the 23rd, but nothing to write home about. I spent a couple of weeks away from home and away from my scope. I wasn't feeling very good this morning and woke up to clear skies. I was staying in Klamath Falls, and in the past I have been quite unimpressed by sky conditions at in-town star parties at the Klamath County Museum. But here, maybe a dozen blocks away and a bit uphill, skies were actually pretty good. When my eyes were dark-adapted, I got a limiting magnitude of 6.4 in Ursa Major. My first binocular target was C/2013 R1 (Lovejoy). I swept it up to the east of the Beehive. Wow! This comet was bright in binoculars. I suspected that I would be able to see it with the naked eye, and I did after my eyes were dark-adapted. I estimated Lovejoy's magnitude as 5.3. The comet had a fuzzy coma with a bright center. The coma appeared about 8' in diameter and a bit squashed, with a diffuse eastern edge and a tail 15-20' in length extending to the west. I decided to go back to bed and get up when I might have a chance to view Comet C/2012 S1 (ISON) and C/2012 X1 (LINEAR). The problem with ISON was that it was behind trees, but eventually it cleared them and I saw a faint, elongated fuzzy patch. The coma was small, maybe 2' in diameter. A very short tail about 8' in length pointed westward. I estimated ISON's magnitude as 7.6. In the brightening twilight, I also looked for C/2012 X1 (LINEAR) and managed to just glimpse it as a very small, round hazy spot. I viewed 154P/Brewington again. Skies weren't great (Friday night football lights and some wood stove smoke), but limiting magnitude was 6.6 up in Pegasus and the comet (near Alpha Aquarii) was high enough to be above the worst of it. In my 10" Dob, the inner part of the coma was visible with direct vision at 47x. This was just a small (<1' diameter) smudge close to a 14th-magnitude field star. With averted vision, a very diffuse outer coma stretched to about 3' in diameter. At higher powers, there was a faint stellar nucleus of about magnitude 14.3, and the inner coma appeared slightly elongated E-W. Overall, the comet was round, and I estimated its total magnitude as 11.4. 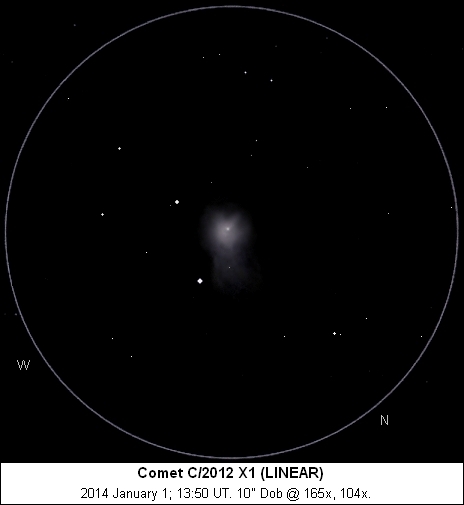 The comet's motion toward the NE was evident after 10-15 minutes. Sketch. I observed between moonset and twilight on the morning of October 15. It was 23 degrees F, but felt a lot colder. Limiting magnitude was 6.8-6.9 overhead, but there was a slight milky look lower on the horizon, and patches of river fog sometimes drifted by down at ISON's altitude. 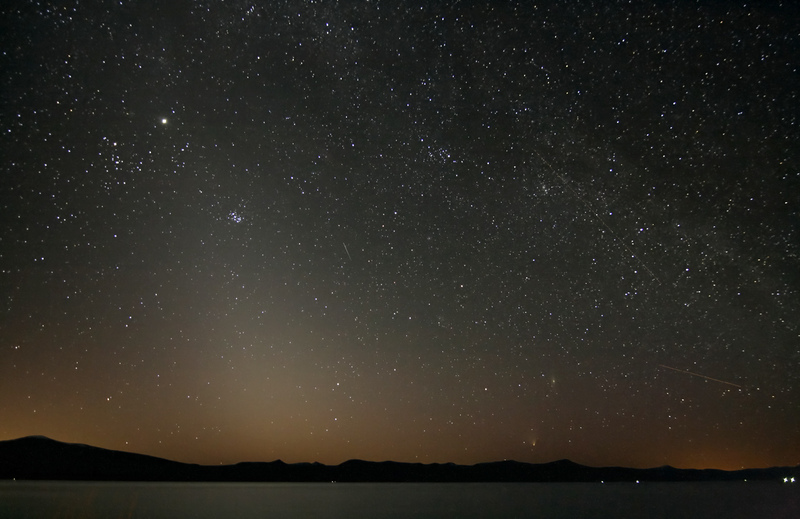 The zodiacal light was very bright just before the start of astronomical twilight. 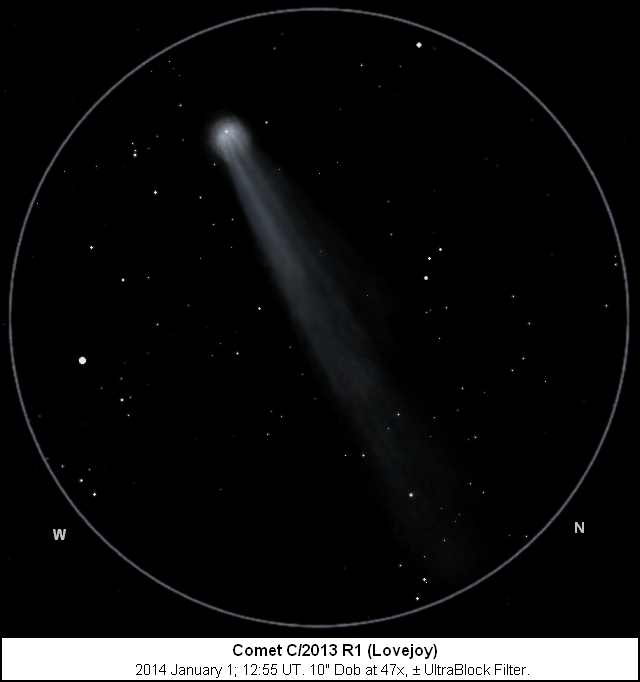 I went for C/2013 R1 (Lovejoy) first, as it was in a more transparent area of the sky. It was a quick and easy starhop from Delta Monocerotis, and obvious in my 10" Dob at all powers. Lovejoy seemed a bit less condensed (DC=3 with a very faint stellar nucleus) than it did 10 days ago. There was a parabolic inner coma about 1.5' across, brighter on the edges and spreading into a short, broad fan in PA~300. This was surrounded by a large, diffuse halo that was round and about 5' in diameter as seen through the 10" Dob. I estimated Lovejoy's magnitude at 10.0. Sketch. I also managed to see Lovejoy through 10x42 binoculars. It was just a very faint hazy spot perhaps 9' in diameter. With binoculars, I estimated the magnitude as 9.0. 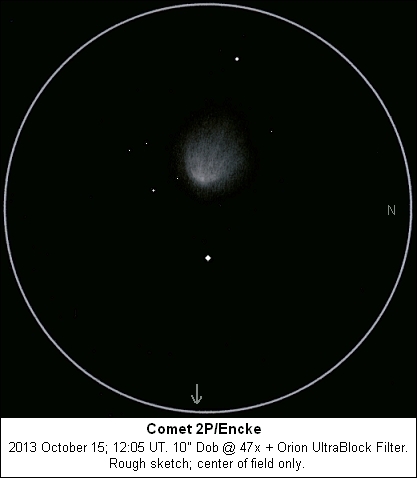 Comet 2P/Encke has also changed since my last observation. It has gotten quite a bit brighter and a little more condensed. Encke was quite easy in 10x42 binoculars, appearing as a round little blob about 10' in diameter with soft edges and a slightly brighter center. I estimated its magnitude as 8.1. In the 10" Dob at 47x, Encke showed a small central condensation near the western edge of a slightly lopsided coma. Several faint jets curved out to form a fan to the east, including a central spine about 7' long in PA~80. The longer I looked, the more prominent the jets appeared against the faint glow of the coma. Rough Sketch. Once again, I saved C/2012 S1 (ISON) for last. After a starhop from Mars, I found the comet in a sparse telescopic star field. 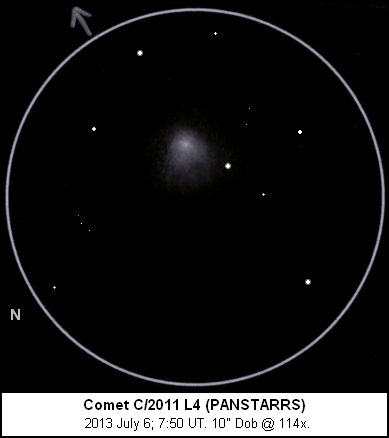 The comet was near the center of a misshapen pentagon of 10th-magnitude stars. ISON has grown and brightened in the past 10 days, and this morning I was able to see a stellar nucleus for the first time. At 47x, I estimated the coma diameter as 4' and the tail length as 10' centered in PA 290. Coma magnitude was 10.0. At 165x, the tail was brighter along the central spine and on its southern edge. I was not able to see ISON in binoculars. Sketch. After my morning session with three comets, I decided to focus on comets the following evening as well. The temperature stayed above freezing. Skies were average for this site; I estimated the limiting magnitude as 6.7 in Pegasus at the end of the session. I had said a conditional farewell to C/2012 F6 (Lemmon) in September, but the comet has remained bright enough to view in my 10" Dob. Not too far from the head of Draco, it also remains well-placed in the sky. At 47x, I immediately swept it up as a small fuzzy spot in a confusion of stars. At 165x, the comet was attractively placed a couple of arcminutes from a pair of 14th-magnitude stars. The comet was about 2' in diameter and maybe slightly elongated E-W. It was moderately condensed, but without a stellar nucleus. The coma magnitude was 12.3. Sketch. My second comet was also a "hanger-on", C/2010 S1 (LINEAR). This comet has remained pretty consistent in appearance. This is a small, compact object that responds well to magnification. I starhopped from the Coathanger to this one. At 165x, I could see the comet as a round fuzz adjacent to several stars. I bumped the power up to 330x for my sketch. The comet is strongly condensed, although I didn't detect a stellar nucleus. With extended averted vision, I could trace the coma out to a diameter of about 45 arcseconds. There appeared to be a diffuse elongation to the SE. I neglected to make a magnitude estimate, but 12.5-13 would be a good bet. Sketch. 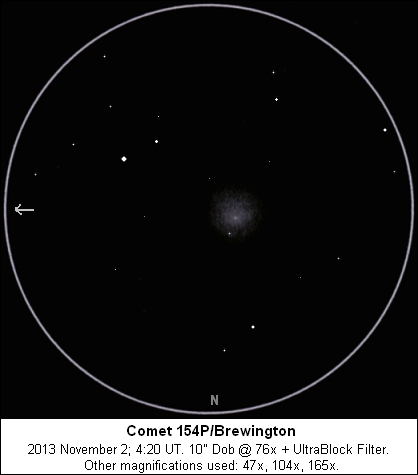 Finally, I got to see something new: Comet 154P/Brewington in Aquarius. At 47x, I could barely tell that there was a ghostly, poorly-condensed haze in the field. 94x was a better power. Brewington's coma responded to a narrowband nebula filter, but not as strongly as 2P/Encke's. Brewington's coma was 3' in diameter and nearly round. The inner 1' of coma was slightly brighter and seemed to be better defined on its eastern edge. I estimated Brewington's magnitude as 11.8. Sketch. I left my 10" Dob on the deck to cool off overnight. I got up before 3am to check out 3 comets in the morning sky. The air was cold, but transparency was pretty good (limiting magnitude probably around 6.8 overhead). My first target was 2P/Encke in Lynx. I previously saw this comet in 1994 and 2003. Once I starhopped to it at 47x, Encke was an obvious fuzzball at all magnifications. The surrounding star field was very pretty with a couple of bright star chains. The comet's eastward motion was obvious within a few minutes. Encke showed a coma about 5' in diameter, round or diffusely elongated a bit to the NE. A small, fairly weak central condensation was displaced to the west of the coma's center. A narrowband filter (Orion UltraBlock) made the outer coma better-defined, although it did not reveal any additional detail or extent. I estimated the coma magnitude as 10.0. Sketch. C/2013 R1 (Lovejoy) was a quick starhop from Beta Monocerotis, although I noticed my Telrad was beginning to frost up. Lovejoy was also an easy object from the get-go. Its coma was smaller but more condensed than Encke's. A 12th-magnitude star was embedded in the coma, and the comet's motion brought the coma's center ever closer to the star. My impression was of a triangular central condensation with a stellar nucleus. Overall, the coma was about 2' x 2.5' and elongated in PA 270. I didn't try a magnitude estimate due to interference from the star. Sketch. Finally, there was (will it or won't it disintegrate) C/2012 S1 (ISON). ISON was buried in the bright zodiacal light near Mars, and the sky background was disappointingly bright. Seeing wasn't good at 20-30 degrees altitude, either, as Mars was twinkling to the naked eye. Nevertheless, ISON was an obvious elongated smudge at 47x, and much easier than when I last observed it on September 11th. I switched to 165x for a sketch, but had persistent problems with eyepiece fogging in the 24 degree (F) air. ISON had an inner coma about 1' in diameter, with a possible outer envelope about double this. The coma appeared more condensed at low power, but with no stellar nucleus. A faint tail extended for 3.5' in PA 295. I estimated ISON's magnitude as 11.1, compared to 11.8 back on September 11th. Sketch. I went after ISON on the morning of September 10th. There was a little bit of scuzz (residual forest fire smoke) around the horizon, but ISON was well above it by 5am. The zodiacal light did brighten the sky a bit. Zenith limiting magnitude was 7.0. I starhopped to the field from the Beehive at low power and since there were only a few minutes of astronomical darkness remaining I went right to my 7mm Nagler (165x). I probably should have used 76x instead, but I wanted to darken the background as much as possible and I expected ISON to be small and condensed and possibly in need of higher magnification to be revealed as nonstellar. The seeing was a bit nervous, but not too bad considering the low elevation (15-20 degrees). My finder chart (printed from Cartes du Ciel) wasn't too precise, so I stumbled around the field a bit. A magnitude 14 field star caught my eye first as looking a bit nebulous (later, back at the computer I saw that it was double, which probably contributed to that effect). After a few minutes, I picked up ISON as a ghostly smudge that was larger than I expected (about 1.5' in diameter). The comet was just a couple of arcminutes WSW of a magnitude 11.5 star. 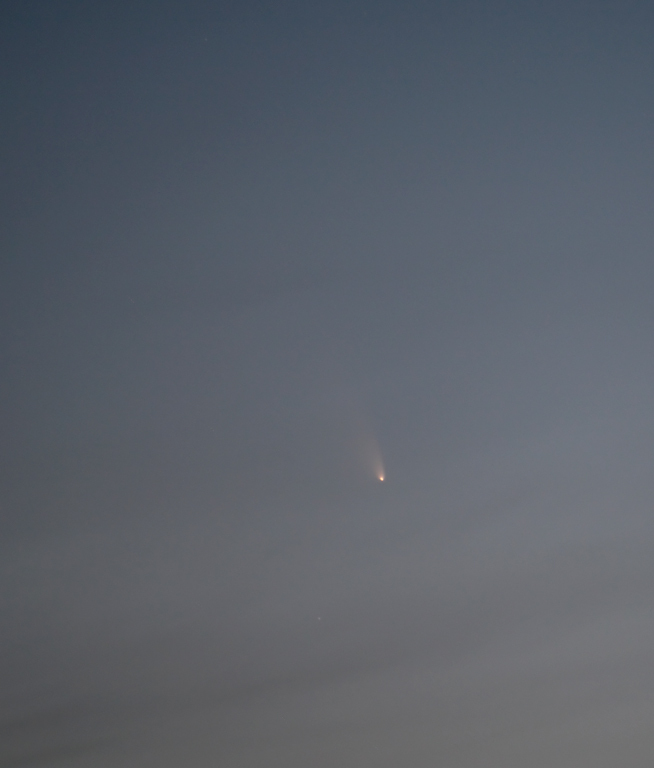 I followed ISON for about 20 minutes before twilight blotted it out. The comet appeared slightly elongated to the NW (PA 290), pointing toward a field star of magnitude 14.5. The coma seemed just slightly brighter in the middle, with no definite nucleus (the mediocre seeing may have affected my impression). Sketch. On September 11th, I also viewed the comet. It appeared much as the previous morning. I estimated its magnitude at 11.8, and its size as 2' x 1.5' elongated in PA 300. I observed these two past-their-prime comets on two evenings during my stay at a dark-sky site. I sketched them on the evening of September 7th and then estimated magnitudes and sizes on the evening of September 9th. Limiting magnitude was good on both nights, 7.0-7.1 high in the sky. When I first starhopped to C/2011 L4 (PANSTARRS) in northern Bootes, I thought I saw a faint fuzz at 47x. I didn't pay much attention and bumped the power up to 165x, which usually is a good power for small comets. I didn't see much at 165x, but when I pulled back to 76x, PANSTARRS jumped out at me as a diffuse patch ~2 arcminutes in diameter and slightly elongated in PA 285. There was a very weak central condensation that was difficult to see at higher power. Viewing for an extended period really paid off by bringing out more of the faint outer coma. Total coma magnitude was roughly 12, but the comet was a fairly difficult object. Sketch. C/2012 F6 (Lemmon) was much easier, more condensed, and obvious at all magnifications. Two stars of 13th and 14th magnitude stood 0.5' and 1' away from the central condensation. The comet had a broad parabolic coma about 1.5' x 2' and elongated to the NE. 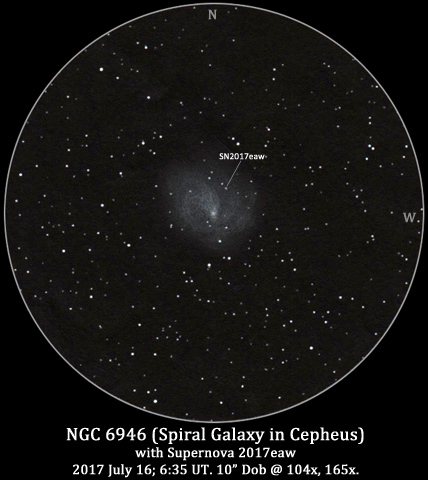 A faint stellar nucleus was visible at 165x. I estimated Lemmon's magnitude at 11.5. Sketch. Since the Perseids were the most strongly-favored shower peak in this bad year for meteor showers, I was disappointed to log a measly 2.7 hours of official observing time. Work, weather, family obligations and the Oregon Star Party all contributed. I tried a watch on the morning of the 11th at OSP, but clouds soon rendered it useless. I had to pick up my aunt at the train station on the evening of the 11th, and between the lack of sleep I got during OSP and the impending work week I was in no condition to observe on the morning of the 12th. So, I settled for a session on the morning of August 13th. Looking at the data from other observers, the 12th was definitely the best morning for the Western US. Perseid rates were definitely far removed from their peak by the time I got set up at 1:11am, and over 2.7 hours of observing time I saw 111 Perseids for an average of 41/hour. 42 other meteors including some long-pathed Alpha Capricornids and Eta Eridanids added to the display. For brief spurts, especially around 3:00am, the Perseids were really exciting, but there were also some devastating lulls. The brightest meteor I saw was a -4 Perseid that had a bright head but left a train that only lasted for a couple of seconds. Other notable meteors included a magnitude 0 Perseid that showed violet and orange tints, a magnitude 1 Perseid that was strongly orange, a magnitude 2 Alpha Capricornid that was red and nebulous, and a magnitude 0 earthgrazing sporadic that left a train visible for 5 seconds. Overall, the Perseids were of about normal brightness, with an average magnitude of +2.0. Sporadics were faint at a mean magnitude of +3.3. There was a bit of smoke early on, but it quickly dissipated in a mild breeze. Limiting magnitude was as good as 6.9 at the zenith, and hovered around 6.7 for most of the session. I had originally planned to view Supernova 2013dy in NGC 7250 a week ago, but smoke from the Whiskey and Douglas Complex fires made me cancel that session. Unfortunately, the smoke has persisted. August 3rd was the first reasonably decent evening we've had since the smoke first blew in. Smoke was still in evidence, especially in the light-polluted areas within 30-50 degrees of the horizon. Above that, the skies weren't too bad. I actually reached a limiting magnitude of 6.9 overhead, above average for my yard. However, that was achieved when I was fully dark adapted and had been viewing faint objects through the telescope for over an hour. In the 10" Dob, I made it down to magnitude 15.7 around M57, but with more difficulty than on July 12/13, and the central star was not visible. Seeing was decent, maybe a bit better than average. In any case, this was an important shakedown session before next week's Oregon Star Party. I quickly star-hopped from the naked-eye star HR8485 to the faint galaxy pair NGC 7248 and NGC 7250. The two galaxies are separated by about 17', so I had visions of sketching them together. However, they are so small and indistinct that they are swallowed up by a wide field of view and only worth detailed examination at high magnification. 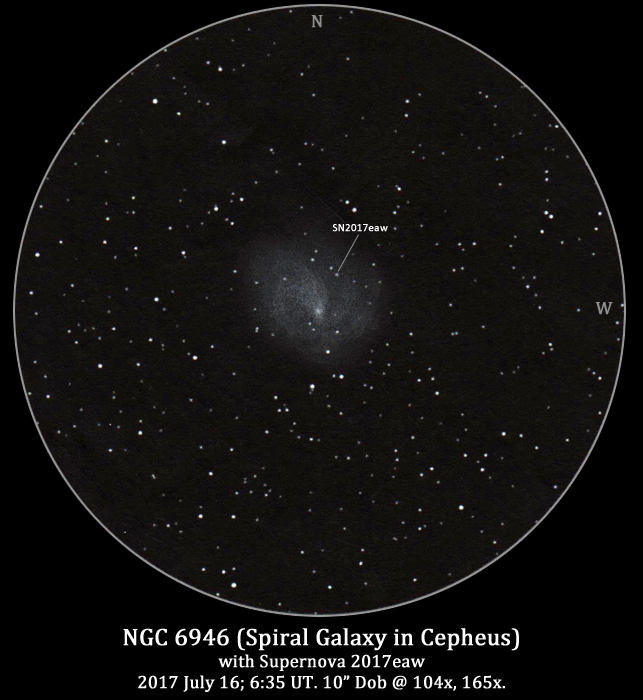 The 13th-magnitude supernova in NGC 7250 was readily apparent at any magnification; however, the galaxy itself was tiny and diffuse. It did respond well when I pushed the power to 330x and spent some time sketching the sparse star field surrounding it while at the same time taking in the galaxy's subtle structure with averted vision. The galaxy's most prominent feature was a brighter core about 1/4 of the way between the supernova on the north and an 11th-magnitude field star to the south, and displaced a bit to the west of this line. The core was small, round and quite condensed. A mottled streak of light projected south of the core for about 45", and occasionally I could detect a very faint oblong halo surrounding this. North of the core, the galaxy was fainter and seemed to stop short of the supernova, although at the very limit of my vision I could occasionally detect a projection hooking around to the west of the supernova. Sketch. NGC 7248 was actually a slightly easier target, but with very little detail visible. It showed a round core with a stellar nucleus, and with averted vision I could make out a very faint elliptical halo about 1' x 0.75' elongated NW-SE. Sketch. 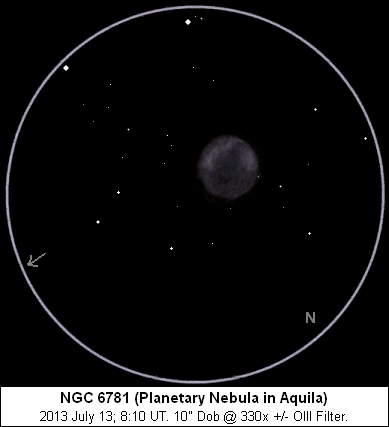 I planned this night as a make-up session for my clouded-out attempt at some planetary nebulae around Aquila. I wasn't too impressed with the sky conditions at first. The Milky Way lacked the contrast that it has on really good nights, and my naked-eye limit was magnitude 6.7 (at or just below average for my yard on summer evenings). On the positive side, the atmosphere was pretty steady. I sketched a couple of the planetaries. 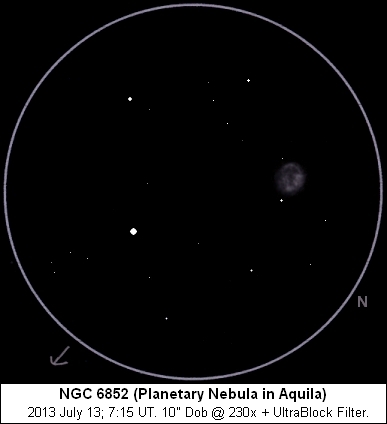 NGC 6852 is a medium-sized and faint planetary sandwiched between a couple of faint stars. It appears as a faint oval spot at medium powers. My OIII filter made everything too dim at higher powers, so I settled for the Orion UltraBlock filter at 230x. With this configuration, the faint star just to the SSE of the nebula seemed to alternately merge with and separate from the disc. 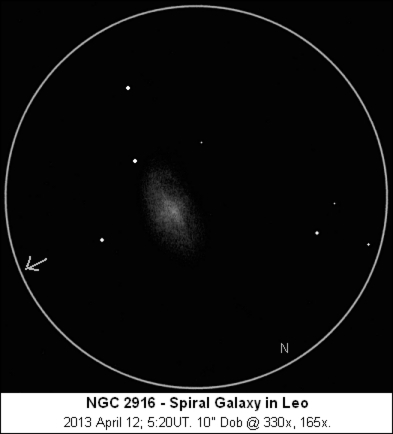 NGC 6852 seemed more or less round or with a slight NW-SE elongation. A couple of brighter spots were visible on the NW and NE edges, and the rim seemed a bit better defined on the SE edge. The interior seemed irregularly darker. Sketch. NGC 6781 is an old favorite, so I was surprised it wasn't included in my list of objects that I have sketched through the 10" Dob. This large planetary appears perfectly round. Unlike NGC 6852, this one takes high power and the OIII filter well. Detail is subtle, but repays extended gazing. The rim still appears perfectly round and well-defined, but the southern half is broadly brighter with some mottling leading to a helmet effect. The center of the nebula and the north part of the rim are dimmer. A faint star almost touches the rim on the NE side. The starfield is suppressed by the OIII filter, but is intimidatingly rich when the filter is removed. Sketch. After these planetaries, I went to the Ring Nebula. I was very surprised to catch a quick glimpse of the central star at 330x. I could see stars to at least magnitude 15.7 around the Ring, and I didn't have my chart that showed fainter stars. It's possible I could have dug out the magnitude 16.1 star if I knew its location. The central star remained an AV4 object (visible only with averted vision, and substantially less than 50% of the time). I tried for IC 1296, the very faint galaxy near the Ring, and initially came up empty. In darker skies, I have found this galaxy surprisingly visible in my 10" at high power. Eventually, I managed to come up with it as a small fuzzy spot at the AV3-AV4 level. * PK 59-18.1 (Abell 72). I think I've looked at this faint planetary in Delphinus before. The main issue is a scattering of stars around the planetary that make it difficult to pick out the faint haze. One segment of the disk shows up better than the others. Surprisingly, filters didn't seem to help much on this one. * UGC 11557 in Cepheus. I don't think I've looked at this faint galaxy before. It isn't much, but it's visible and looks a lot like ... a faint galaxy! * PK 104-29.1 (Jones 1). I've sketched this large planetary before. It appears very washed-out and low-contrast (but still visible) without a filter, but the OIII filter brings out a lot of detail. * PK 72-17.1 (Abell 74). I've certainly missed this huge and very faint planetary before, even under very good skies. But I tried it anyway and could make out a very faint glow with an OIII filter in place. I think I was only seeing about a third of its circumference (apparently a brighter portion). I didn't sketch it as I was about at my limit, but I certainly closed the book on this session looking forward to a showdown with this object at OSP if the skies cooperate. I spent a bit of time playing around with viewing familiar objects such as M5, M27 and M11 through my different eyepieces before turning to the fading comets that were stars of the spring sky. First up was C/2012 F6 (Lemmon), parked near Beta Cassiopeiae. Lemmon's coma was concentrated and round like an unresolved globular cluster, but had an off-center stellar pseudonucleus. A faint cyan tinge was visible in the inner coma. Coma diameter was about 3.5'. A very faint, fuzzy tail was visible to the SSW, no more than 10' in length. Sketch. I starhopped to C/2011 L4 (PANSTARRS) from Alpha Draconis. The comet has faded considerably since last month, and I could no longer make out an antitail. The comet showed a ghostly parabolic coma about 3' across and fading gradually into the sky background. There was a small, non-stellar central condensation. The coma widened to the ENE, and there was a suggestion of a start of a fan-shaped tail, but this couldn't be traced for more than a few arcminutes. Sketch. I intended to go out again on July 6/7 to observe some planetary nebulae, but some surprise clouds proved to be so persistent that I packed it in. 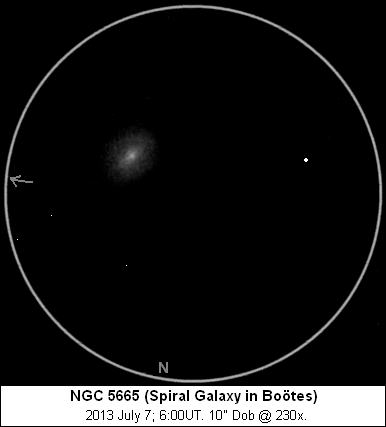 While trying to find something to look at in a clear area of the sky, I sketched the galaxy NGC 5665 in Bootes. This little galaxy is visible as an oval smudge at low power in the 10" Dob. At 230x, It showed a bright, bulging inner region surrounded by a diffuse halo. There was a hint of mottling near the nonstellar nucleus. Overall, the galaxy was elongated NW-SE, with dimensions of about 2' x 1.5'. Sketch. Alerted to the possibility of a meteor outburst, I did a quick 45-minute session under good skies from 8:15-9:00 UT on June 11. I saw 8 sporadics and 2 anthelions, but no good candidates for the putative Gamma Delphinid shower. I definitely don't get out with the Dob as much as I used to--hectic work schedule and not enough energy left at the end of the day, plus competing hobbies that favor the daylight hours. On this Friday night, the stars aligned (so to speak) and I thought I'd give it a go, at least to visit these two comets. C/2011 L4 (PANSTARRS) was favorably positioned near the North Celestial Pole, so I hunted it down right after the sky got dark (which is none too early in June). I had some issues with finding a decent place to set up while dodging all the neighbors' porch lights, but I finally settled in. PANSTARRS has faded considerably since I last viewed it in April, and was difficult in binoculars due to its proximity to a bright 7th-magnitude star. I was able to see it better a bit later when it had moved a bit, and at that time I estimated the comet's magnitude at 9.4. In the 10" Dob at 44x, the comet showed a round coma about 4' in diameter with a stellar pseudonucleus offset a bit to the NW of center. A couple of small jets were visible to the SE, the beginning of a fan-shaped tail that stretched for 25-30' in PA 130. Even more striking was the antitail that stretched for at least 1 degree in PA 355. The first 20' or so of the antitail were narrower than the coma and had a higher surface brightness than the other tail; beyond that, the antitail broadened and gradually faded into the sky background. The starfield seemed pretty crowded for this region of the sky. Sketch. Naked-eye limiting magnitude was 6.7. The seeing sucked, so I didn't spend much time on Saturn and only glanced at a few showpiece objects before retiring for a quick nap. 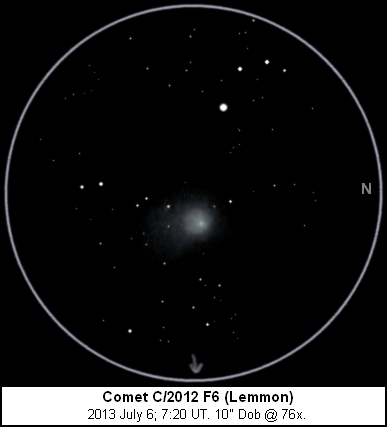 Comet C/2012 F6 (Lemmon) graced the morning sky not far from M31. It was quite easy in binoculars; I estimated its magnitude at 8.0. In the 10" Dob at 44x, Lemmon showed a round coma 7' in diameter. The coma was fairly condensed, but lacked a stellar pseudonucleus or any internal structure to speak of. It had a faint cyan tinge. A faint, narrowly fan-shaped tail extended for at least 25' and maybe up to 40' in PA 235. There was a hint of faint linear structures in this tail, as well as a thin northern branch in PA 250 that may have been the ion tail. Sketch. I had only seen a few Eta Aquarids during a few years--this shower is difficult to observe from latitude 42.6 North because the radiant is still low in the sky at the start of astronomical twilight. Also, the weather is usually bad, or the Moon is in the way, or I'm sick ... This year was better, and the shower showed signs of higher-than-normal activity. I got out for about 1.5 hours of observing this morning. I didn't quite make my planned 3:15am start time, but as I was setting up I did see my first Eta Aquarid (a +3 earthgrazer) at 3:15 (1015 UT). A couple of minutes later, I saw a brighter one as I started my watch. Activity was pleasantly high, with a few lulls (droughts of 10, 8, and 11 minutes) and one big spurt (5 Eta Aquarids and 1 sporadic in 1 minute around 1118 UT). For the first half-hour (radiant elevation 5-10 degrees), the Eta Aquarids all showed earthgrazer characteristics, with long paths and persistent trains even on the fainter meteors. A memorable orange ETA of -1 shot for about 70 degrees directly overhead and faded out behind me. I ended up seeing 24 Eta Aquarids and 10 sporadics. Skies were average for most of the watch, with a little dip in the limiting magnitude as the moon rose above the ridge to the east and quick deterioration due to twilight during the last 18 minutes of the watch (which only produced 4 meteors). The Eta Aquarids were not especially bright, with nothing brighter than -1 and a mean magnitude of 2.2. This morning's session went much better than my previous attempts to view the Eta Aquarids (the best "highlight" I could find in my logs was a grand total of 6 ETAs in 45 minutes in 2002 [also 9 in one hour in 2008]). On the morning of April 17th, I was frustrated by clouds that eventually cleared off before morning twilight leaving just a bit of high haze behind. 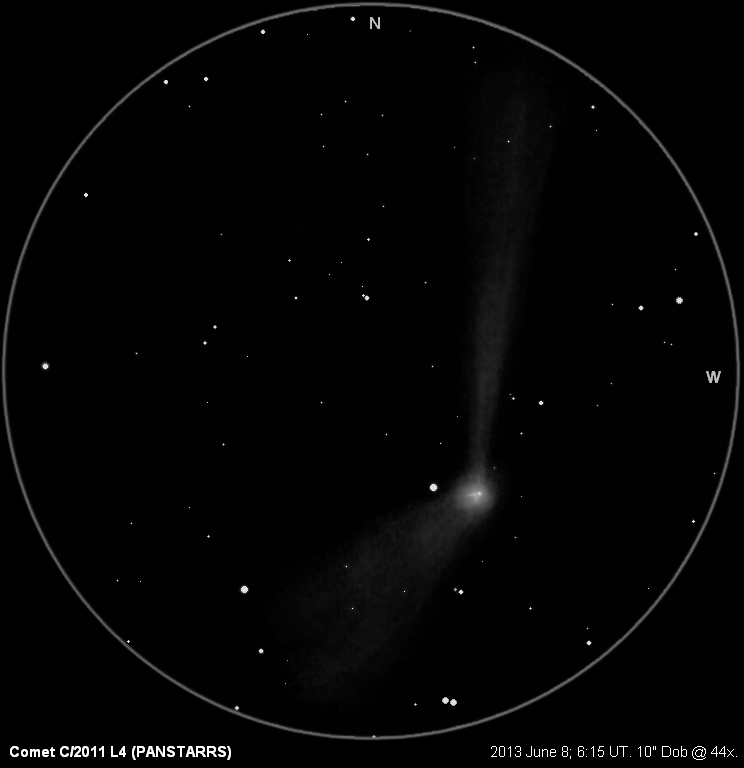 I took the opportunity to view Comet C/2011 L4 (PANSTARRS). The comet is in Cassiopeia now. It is circumpolar from Oregon, but is higher in the predawn sky. 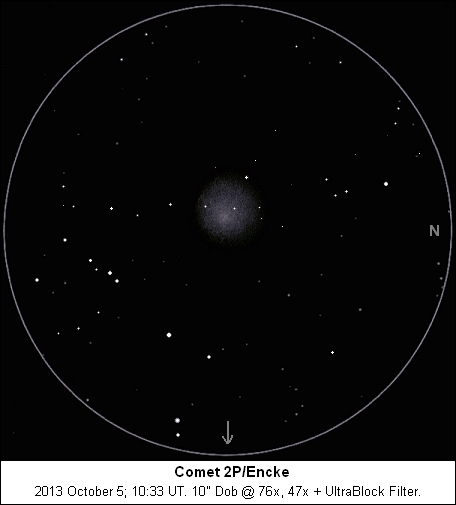 The comet was still an impressive naked-eye object, appearing as a diffuse streak about 1 degree long. I'd roughly estimate the integrated magnitude (coma + tail) as about 4.5. Binoculars revealed more detail, but didn't extend the tail length. I was able to take a quick check of the comet with naked eye and binoculars on the morning of April 21st at the onset of astronomical twilight. The comet was still a naked-eye object, although it had faded somewhat. I was able to get a good estimate of the magnitude of the coma by itself (m1). With the naked eye, the coma magnitude was 5.8, and with 10x42 binoculars, the coma magnitude was 6.5. The tails appeared much as they had on the 17th. I had some rotten luck with clouds being in the wrong place for several days. On Wednesday the 13th, I had to work until 8pm but managed a quick view of the comet through binoculars before it sank into clouds. I finally got a decent view of the comet on Thursday evening, March 14th. It was readily visible in 10x42 binoculars at 7:45pm, and within 10 minutes or so I got some naked eye glimpses. The comet looked slightly orangish in binoculars against the bright blue twilight sky. The head is very strongly condensed, with an essentially stellar pseudonucleus as seen through binoculars, and the tail is pretty short, maybe a degree or more in length. I could see a short section of the tail with my naked eyes. I would put the coma magnitude at +1 or a little fainter, although the variable thin cloudiness didn't let me get a really good estimate. Here's a wider shot with the comet above tree branches. The star to the upper left of the comet looks to be 4th magnitude Delta Piscium. The comet sank pretty quickly, and there were thick cloud bands on the horizon. Five minutes later, the comet emerged from the bottom of the dark cloud in the photo, but it was strongly reddened and dimmed by atmosphere. I lost it for good at around 8:25. I also saw the comet on Friday evening, March 15th. 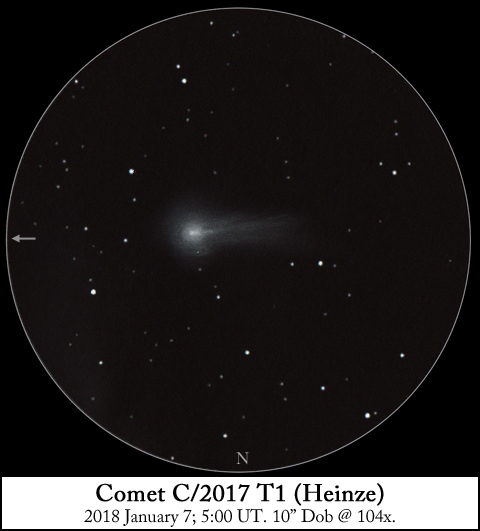 There was still a thick cloud band on the horizon, and the seeing was terrible so viewing the comet through a small refractor didn't reveal any fine detail. My best views of the comet came on Sunday, March 17th. I estimated the coma magnitude at +1.4, and the tail stretched for 2-3 degrees. There was still enough murk along the horizon that the views were better earlier despite the brighter sky. I saw the comet again on Friday, March 22nd. The comet was still an easy binocular object, but only a marginal naked eye object in the moonlight, twilight and haze. I estimated the coma magnitude as +2.8 with the naked eye, suggesting a very significant fading. I could maybe scratch out a degree or so of tail. On Friday, March 29th, I got my first views of the comet without competition from twilight or moonlight (but still very low in the sky). The comet, despite having faded to ~magnitude 3.9, was an easy naked-eye object with about a degree of tail. In binoculars, it was impressive, with a broad and bifurcated tail stretching for 3-4 degrees. I made a quick sketch through my 60mm refractor, and also took a wide-angle photo to capture the mood of the scene. I observed the Quadrantids for 1.8 hours from my yard on the morning of 2013 January 3, from 1228-1418UT. Temperature was a frigid 1.5F (-17C), and the sky was very clear without a hint of fog or haze. On the downside, the moon was shining off 2 feet of snow. I blocked the moon behind a spruce tree and accepted some obstruction from this tree and another tall tree in my field. Limiting magnitude was a steady 5.8. Meteor activity was slow at the beginning of the watch, and picked up in fits and starts thereafter. I ended up seeing 58 Quadrantids and 13 other meteors. Mean Quadrantid magnitude was 1.5, while the sporadics averaged 2.5. Ten Quadrantids were in negative magnitudes, but none brighter than -3. Most of the brighter Quadrantids were yellowish, and only a few left wakes. One highlight: a spectacular magnitude +1 earthgrazing sporadic that was orange with a well-defined train. A -5 Iridium flare also gave me a start, as did occasional chattering noises from mystery creatures stirring in the dark. Observations from 2008-2012 are now archived.